If you choose to do so, you can help the rebel groups put an end to the war. 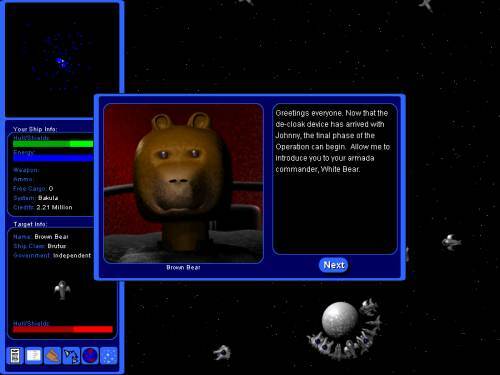 Follow the epic storyline on a variety of exciting missions. As a lowly recruit you will be forced to run deliveries through pirate infested space. But as your rank increases you will become an important member of the rebel organization, taking part in assassinations, massive battles, reconnaissance, and demolitions. There are hundreds of planets to explore and trade on. By using the mission board interface, available on every planet, you can accept missions to earn extra cash. Delivery missions are always available, as are bounty hunting missions. If you own a cruise ship, ferrying passengers is an option. Sometimes rare and deadly space creatures are spotted by the local government and it will be your task to hunt them down. 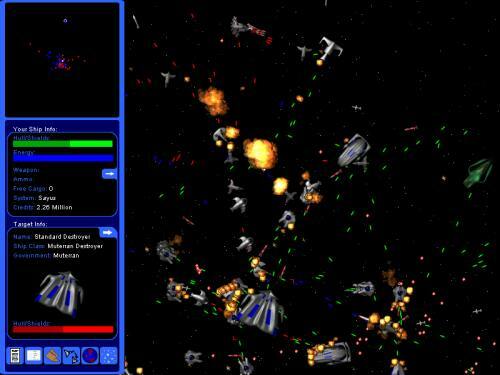 There are always new missions available for you as you travel the galaxy in search of fame and fortune. To get the toys that you want, you're going to need some serious cashflow. Fortunately, there is no shortage of opportunity in the galaxy to make a king's ransom in galactic standard credits. Trading commodities is always a popular way to make money but running cargo between different worlds can get dangerous sometimes. Deadly space pirates will often attack traders as they make their cargo runs. It is not uncommon for a well intentioned delivery of robodogs from Earth to Alpha Centauri Prime to end in a violent explosion. 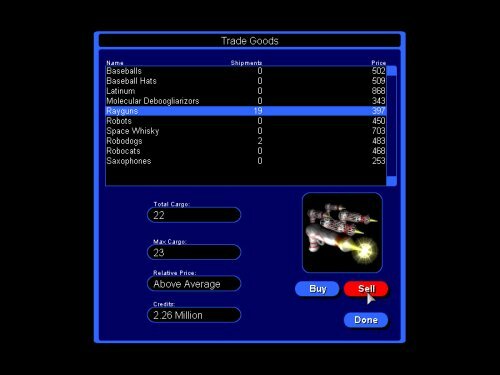 The galactic stock market is the easiest way to make money quickly, but it is also the easiest way to lose money quickly. Because of its highly volatile nature, most experts say that diversification is the key to minimizing risk. Others say that key to maximizing fun is putting all your money in one stock and hoping for the best. If you're going to get anywhere in the universe, you're going to need a nice ship. Sure, your generic all-purpose shuttle may get you where you want to go, but it won't always get you there in one piece. Perhaps you just want a ship with a good cargo capacity or perhaps you're looking for something with a little bit more firepower. 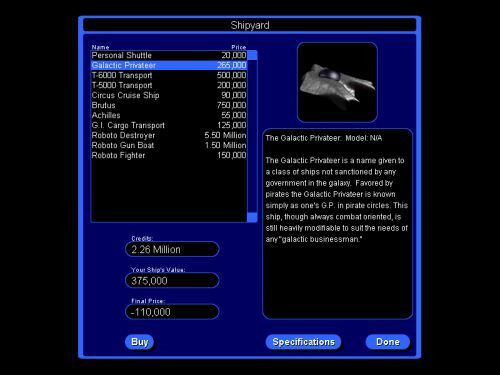 There is a myriad of options awaiting you in the shipyard. Once you have chosen an appropriate ship in your price range, you are going to need to outfit it with some weaponry. The weapons shop has a great selection of weapons to choose from. From your basic low-yield missile to the deadly Omega Missile, there is always something to fit your needs. 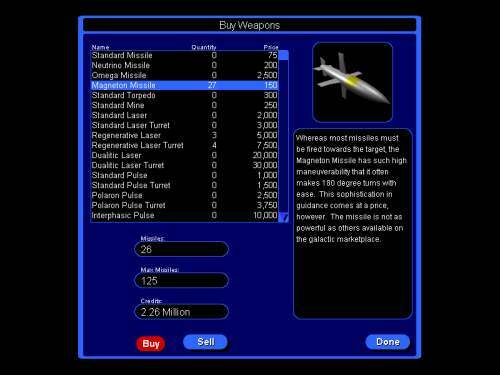 Torpedoes, missiles, lasers, pulsers, and mines are all available to buy. Sometimes you need a little bit more from your ship but you don't have the credits to buy a brand new ship. Upgrading your ship is often the best option. Give your ship a little more kick with some new thrusters, or upgrade to some protoplasmic shielding to protect against those blasted pirates; upgrading can turn your run of the mill Kermodeon Destroyer into the most powerful ship in the universe.